December 11, 2012 By Allyson 9 Comments This post may contain affiliate links. Read my disclosure policy. 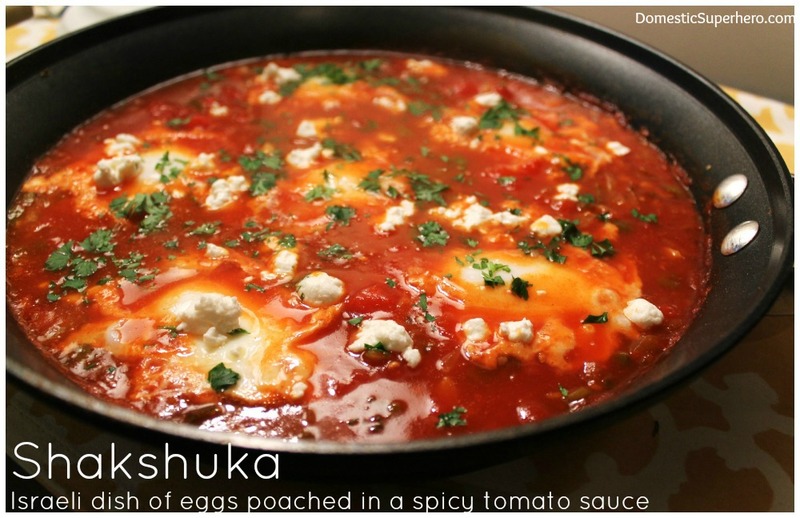 One Pot Shakshuka is an Israeli dish of eggs poached in a spicy tomato sauce! If you follow my blog, you most likely know that I make a lot of poached egg type of recipes. After I shared my Mexican Baked eggs a while back, one of my friends, Becky, said that I was making Shakshuka! She said while a little different, it was basically the same. Living in Israel she would have this dish regularly, and suggested I make it true to the recipe. She said I would love it.I of course thought it looked delicious, because I love basically anything having to do with eggs. I got to making it a few days later. 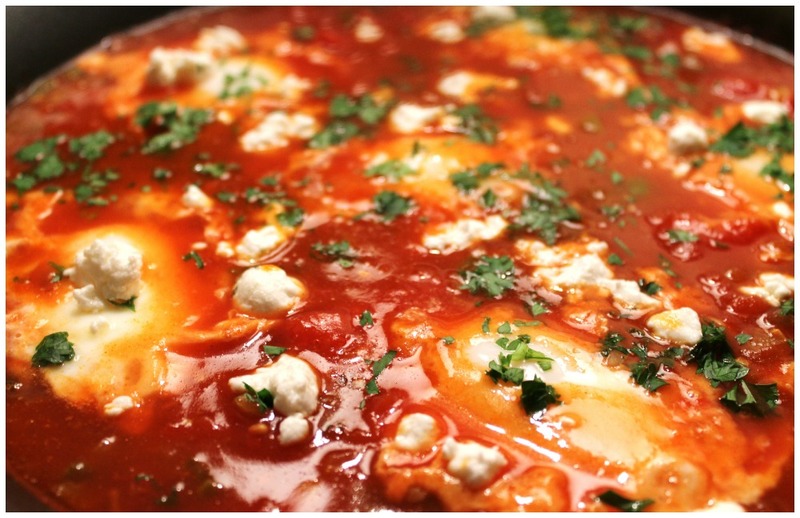 It is a very simple dish of of eggs poached in a spicy tomato sauce and topped with feta cheese and parsley. It is so simple to make, healthy for you, budget friendly, and it tastes so delicious. Becky was right. Serve this with warm pitas and hummus and you have an authentic dinner. Also, if you are nervous about poaching eggs, this is the perfect recipe for you because it takes no effort. You crack the egg into the sauce, and let it cook. No messing with it, no removing it, no stress or worry. Heat oil in a large skillet over medium-high heat. Add jalapeños and onions and cook, stirring occasionally, until soft and golden brown, about 5-6 minutes. Add garlic, cumin, and paprika, and cook, stirring frequently, until garlic is soft, about 2 more minutes. Crack eggs over sauce so that eggs are evenly distributed across sauce’s surface. Cover skillet and cook until yolks are just set, about 5 minutes. Using a spoon, baste the whites of the eggs with tomato mixture, being careful not to disturb the yolk. Sprinkle shakshuka with feta and parsley. Scoop into bowls and serve with pitas, for dipping. **For me, this dish was not very spicy, but if you are serving to children you may want to adjust the pepper content. 1 would probably be enough, but if you have a child who doesn’t mind a little spice, go ahead with the three. Wow! This looks amazing and so easy! How would you suggest to serve it? It is! How do you mean? Like with what sides? I would serve it with some pita bread and maybe a nice salad! I was wondering if you serve it on a plate or in little ramekins or bowls? Or is it just for dipping into? Oh! I usually just use a spoon and put it into bowls. It would definitely be cute in ramekins! I think you could also serve it over rice or quinoa for a heartier meal.